What Day Of The Week Was June 4, 2010? 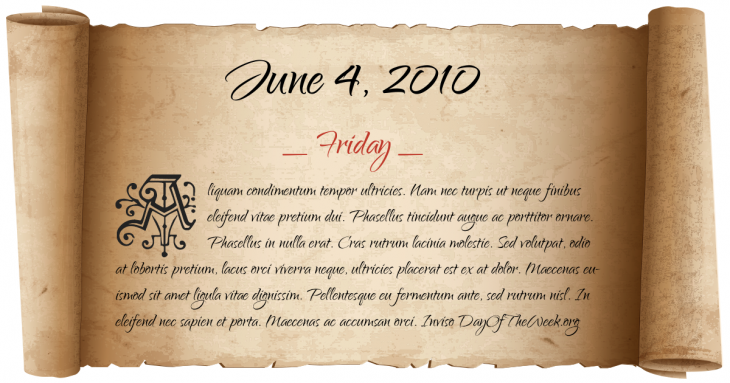 June 4, 2010 was the 155th day of the year 2010 in the Gregorian calendar. There were 210 days remaining until the end of the year. The day of the week was Friday. A person born on this day will be 8 years old today. If that same person saved a Nickel every day starting at age 5, then by now that person has accumulated $70.85 today. Falcon 9 Flight 1 was the maiden flight of the SpaceX Falcon 9 rocket, which launched from Cape Canaveral Air Force Station Space Launch Complex 40.